For the first time,’ une Semaine de l’Architecture’ registers in Brussels. For a few days it will spread out its representation of today’s architecture and what it at stake, through those who produce it. A clearly oriented approach towards meeting the «general public». 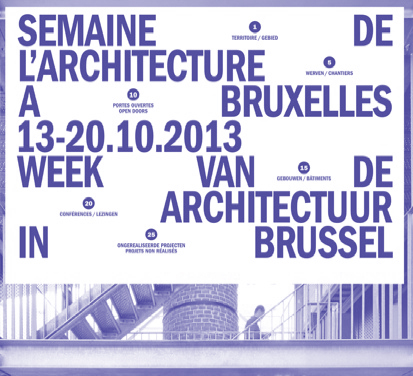 On the initiative of the secretary of state in charge of the town planning of the region of Brussels capital, ’ une Semaine de l’Architecture’ will be held for the first time from the 13th until the 20th October 2013. The name: A. WEEK. For its first edition, A.WEEK wants to put in place a clear basis of what has to be a week of contemporary Architecture in Brussels by a juxtaposition of “pièces à conviction”. ’ Une Semaine de l’Architecture’ is not only the gathering of its participants, but also the encounter between architecture and its audience. Far from a new ‘conversation between architects’ A.WEEK presents the backstage of Brussels architecture to its audience, in a factual way.